This wall clock from the mid 1970s is an early quartz clock, dated 1977, with a 'digital' display formed from flip-over numerals. The display is advanced each minute. 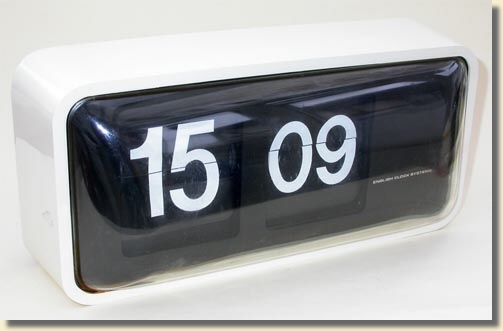 A triple-height version with day and date was also available. The movement was made in France by Bodet, and marketed by ECS in the UK. The ECS name to the right of the display is simply stuck onto the interior fascia. The movement is manufactured from both metal and plastic parts and is quite substantially built. The outer case is plastic. The circuit board and the coil to drive the drum of numerals are together at the right hand end of the clock. 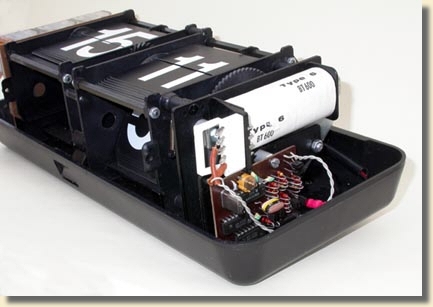 Three 'C' sized batteries (LR14) power the clock, and are mounted in battery holders at the left hand end of the movement. The circuit board uses integrated circuit chips, but resistors and capacitors are still discrete components, and fairly large. There is no attempt at miniaturisation. 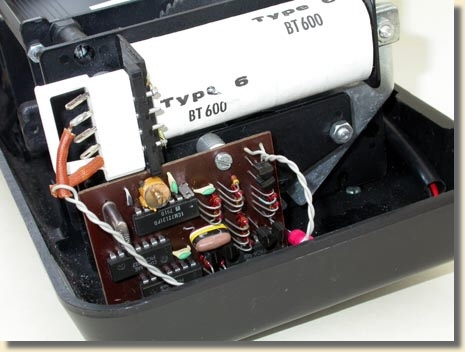 This movement could also be supplied to operate from a master clock by removing the quartz circuit board, and connecting the coil to the master clock's distribution circuit. It required a pulse each minute.